The Britannia Building Society is set to merge with Co-operative Financial Services (CFS) on 1 August after its members gave the move the go-ahead. The two mutuals - which promised there would be no compulsory redundancies - will take up to three years to integrate and some branches may close. Some 88.6% of Britannia savings members voted in favour of the deal at its AGM. The business will maintain a presence in Leek, Staffordshire - the home of Britannia - and Manchester, the home of CFS. More than the required 75% majority of savings members at Britannia voted in favour of the move, and 86.2% of borrowing members supported the proposal, more than 50% majority required. The merger had already been approved by the Co-operative Group and CFS boards. Customers will see no immediate change to the products and services. The enlarged business will continue to trade under both the Co-op and Britannia brand names. That means anyone with savings accounts at both organisations will retain their separate £50,000 deposit protection offered for each business by the Financial Services Compensation Scheme (FSCS). 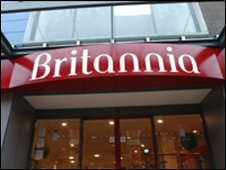 Funds will be safe even if savers put up to £50,000 in a Britannia account and up to £50,000 in a Co-op account after the merger. The whole issue of deposit protection is being reviewed by the Financial Services Authority. The new business will be led by current Britannia group chief executive, Neville Richardson. Bob Burlton, the current CFS non-executive chairman, will chair the new board. "We will remain mutual, we will maintain an extensive branch network and we will continue to share profits with members," said Mr Richardson.